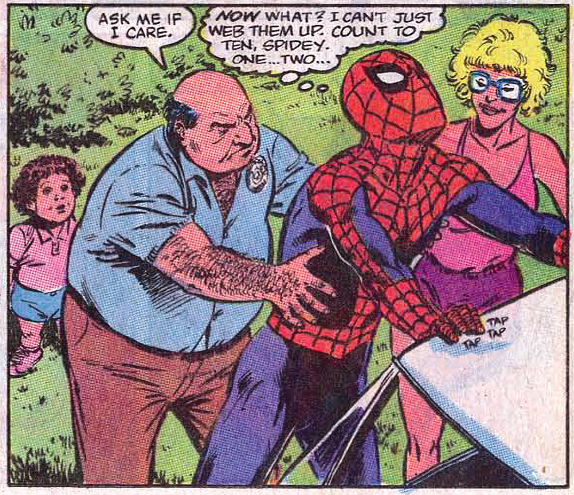 Amazing Spider-Man #267 and the Funniest Spider-Man Comic Ever? Home » the big box of comics » Amazing Spider-Man #267 and the Funniest Spider-Man Comic Ever? It’s a comic that’s near and dear to me for a number of reasons – most notably because before I moved to New York City proper eight years ago, I was a small-town suburban kid who lived in a quiet little town not unlike the one Spider-Man visits in this issue (though I’m originally from Long Island, not Westchester County). When I was the age of the child on the big wheel in this issue (who I’m going to guesstimate is about 4-5), I absolutely used to make-believe that “real” superheroes, whether it was Spider-Man, Batman or the Teenage Mutant Ninja Turtles, were there alongside me as I play-fought against various forces of evil in my backyard, or on the playground at the elementary school up the block from my house. In my heart, I knew these dreams would never come true because why would a superhero ever bother to visit my boring Podunk town (ignoring the fact that these superheroes are also fictitious characters and that I had no legitimate training that would have prepared me to battle Doc Ock or Shredder). But beyond any real world vs. comic book world comparisons and analogies, what stands out the most to me about this comic is that it might very well be the funniest single issue in Spider-Man’s 50+ years of history. While more contemporary writers like Dan Slott or Zeb Wells are adept at mixing in some zing-tacular one-liners into their stories, I challenge anyone out there to find me an example of a Spider-Man comic that is as consistently funny as ASM #267. There’s a reason why David has long been known as the “funny writer” for Spider-Man, despite the fact that he’s the evil genius behind the gut-wrenchingly somber “Death of Jean DeWolff” arc in Spectacular Spider-Man a few months after “Commuter” was written. What makes this comic such a revelation is two-fold. There’s the classic “fish out of water” angle where Spider-Man is lifted out of his comfortable New York City surroundings into an unfamiliar neighborhood where he’s unable to swing from skyscraper to skyscraper in order to catch the bad guy. And then there’s David’s portrayal of suburban New York as a hotbed of absurd personalities and situations. The end result is a comic that plays out like a highly intelligent sitcom (think The Simpsons in its early/mid-90s prime). Everyone in the cast (even Spider-Man) is portrayed as being completely out of their minds, but there’s such a frenetic energy in how everyone interacts with each other, that you can’t help but sit there was a big goofy smile on your face while you’re reading this thing. And despite the fact that this comic’s story is driven by this wholly unique concept, at its core, ASM #267 is unquestionably a “true” Spider-Man tale. 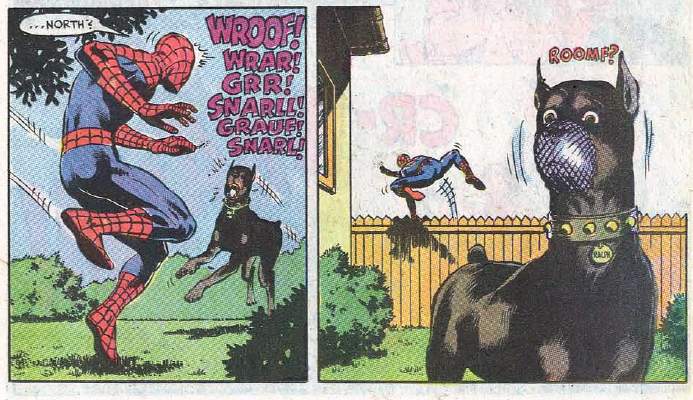 The whole Spidey in suburbia dynamic is put into place because of Peter Parker’s infamous “luck.” After catching a burglar in the act, Spider-Man is duped into thinking the thief is carrying a hostage (it’s a mannequin) and a gun (it’s not real). While chasing the man into the subway, Spidey is tackled by some police officers for “jumping the turnstile,” and the thief gets away (but not before Spider-Man nails him with a Spider Tracer). Just in case any of you out there are questioning the plausibility of the aforementioned scene, let me say that turnstile jumping is taking very seriously in the New York City Subway system and yes, you will get tackled (pretty much immediately) if you ever attempt to do it, even if you think you don’t see a police officer within 100-feet of the area. When Spider-Man finally puts all the clues together and realizes he has to hoof it up to Scarsdale, NY, to find his criminal, David finds new and inventive ways to top himself in the humor department, starting with Spider-Man webbing the mouth of a Doberman shut. Followed by Spider-Man falling out of a tree because its limbs can’t support his weight. And then Spider-Man having to web up a suburban couple after the husband accuses our favorite Web Slinger of sexual harassment. Further elevating this story into the single issue “pantheon” discussion is the fact that Spider-Man is doing all of this, not in an effort to bring down the likes of Doctor Octopus, the Green Goblin or Doctor Doom – but in pursuit of some regular schmoe named “Ron,” who lives a fairly boring life with his wife Mona (outside of the fact that he just stole some money). Demonstrating just now dull Ron is, artist Bob McLeod gives us one page of panels showing Peter at his breakfast table stressing about the events of his upcoming day, while the burglar slumbers in his bed, with nary a worry in the world. Still, despite the heightened absurdity of the comic’s central conflict, at no point do I ever question Spider-Man’s characterization in the issue. Sure, Ron is just a guy, and not a supervillain, but Spider-Man learned long ago that he can never be selective “with great power, must also come responsibility” mantra. So, of course, after witnessing this schmuck commit a crime, Spider-Man is going to trudge all the way out to Scarsdale to take care of him. To ignore this criminal, regardless of how much of a threat he actually is, would be inherently un-Spider-Man-like. 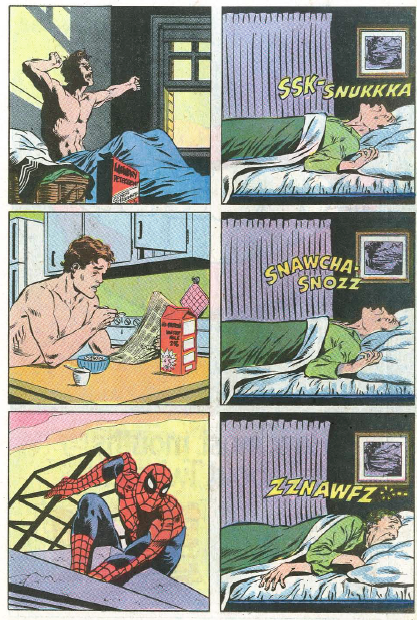 By leveraging Spider-Man’s guilt and never-wavering obligation to do the right thing, David is able to successfully transition the hero to this wacky new universe where he can keep dropping banana peels and pulling the rug out from underneath him at the end of every sleep suburban street corner. 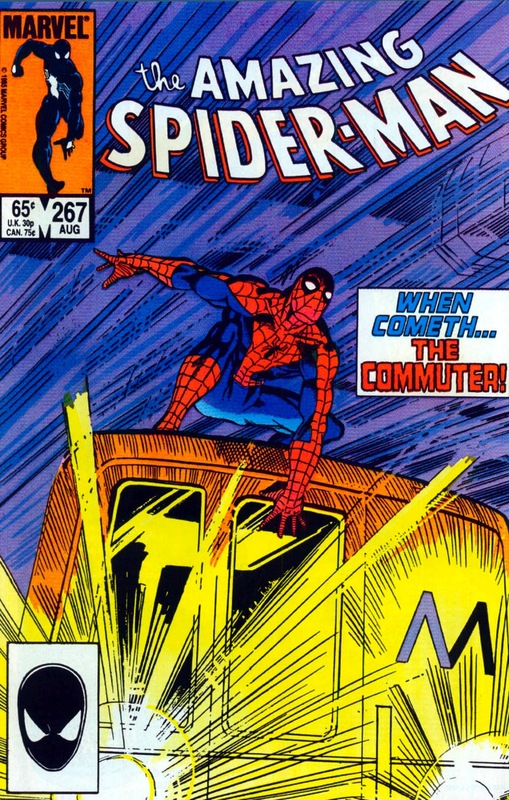 I was thrilled to see readers selected “Commuter” for Comics Should Be Good’s 50 Greatest Spider-Man Stories list last year, as it really is in a class of its own when it comes to Spider-Man’s vast library of storylines. Similar to the comic I wrote about last week, there’s nothing particularly consequential about the events of this issue, but in a way that’s different from ASM #271, ASM #267 is the quintessential “evergreen” Spider-Man story that can be picked up by anyone, at any time, and still hit all the marks it intends to hit. Outside of some talk between Spidey and the Human Torch in the beginning about the symbiote black costume, there’s really nothing in terms of Spider-Man continuity and background that should trip up any casual fans, and the overall concept of the issue is so accessible, that I could probably describe the plot to non-comic book readers and get them interested in reading it. Plus, it’s a story straight out of my childhood imagination. How can anyone argue with something like that? For me, Spectacular Spider-Man #185 is the funniest Spidey story ever. I dout you’ve read it, but I have three words for you: Leapfrog vs. Walrus. I also loved this issue becuase it is one of the first “old” back issues I ever bought. 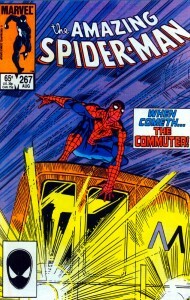 My favorite part is definitely Spidey chasing the criminal in a cab where it ends in a collision Blues Brothers style. I bought this comic and the previous issue on release and made a point of searching out the writer Peter David wherever he appeared. He has yet to let me down in over twenty years of reading comics. 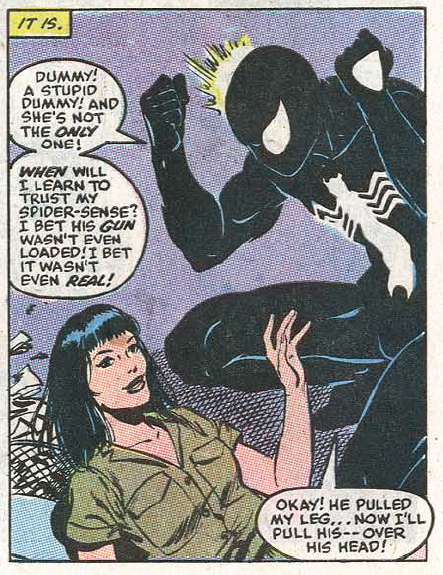 If you’re wondering how a robber with no powers could give one of the world’s foremost superheroes so much trouble, Spidey’s especially bad bout of Parker “luck” was later explained as a side effect of his relationship with his gorlfriend Felicia “Black Cat” Hardy who had earlier received bad luck powers from the Kingpin’s scientists.